If you do a Google search of “What is the gospel?” you will find that almost all Christian denominations (especially evangelicals) that center their faith on the Bible, conversion, the cross and the resurrection explain the gospel in this way. First, admit that you are a sinner. Second, understand that this sin separates you from God. Third, we cannot bridge this separation with good works. Fourth, we deserve hell. Fifth, in order to be saved from this problem we need to receive Jesus by faith and trust what he did on the cross to save us. 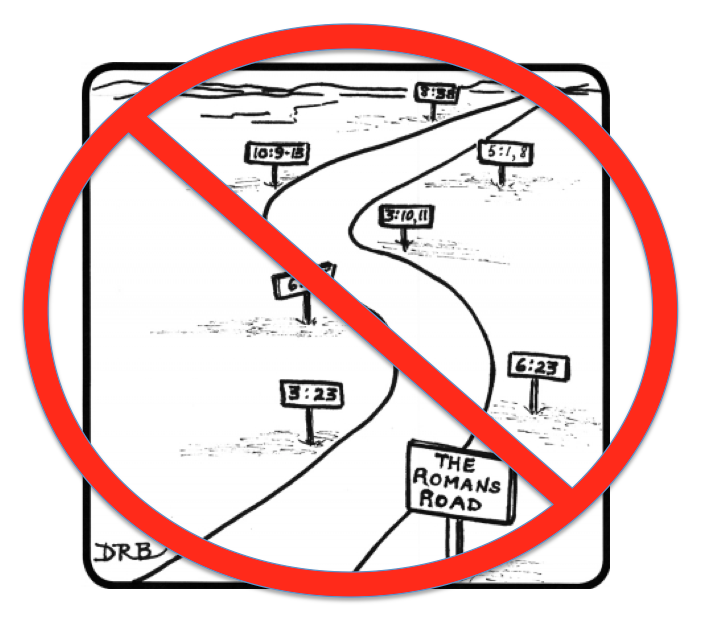 These “gospel road maps” are usually supported by a chain of contextless proof texts like Romans 3:23, Isaiah 59:2, Romans 6;23, Ephesians 2:3, Romans 3:10-11, 2 Thessalonians 1:9, John 14:6, Acts 4:12 and 1 Peter 2:24. The problem is that this “plan of salvation”, however, is not the Gospel. It is an entirely modern man made construction designed to help folks make a personal decision and become converted. I do want to be clear personal conversion is absolutely necessary to become an authentic “saved” disciple of Jesus Christ. However, conversion or salvation is not the Gospel. The “good news” is not that I can be saved. To put it as simply as I can the good news is that Jesus is the Christ. The word Gospel means “good news”. The result of the good news is salvation, the indwelling Spirit and the union of heaven and earth in one new creation. In this article I would like to separate what grows out of the gospel from the actual Gospel itself by showing you how the Gospel is “good news”, how this good news is about Jesus and how this relates to the title Christ. I propose that the Gospel should be defined by what it is and not what it does so that we can move away from making every issue or opinion of standards, right living, personal holiness and sanctification a “gospel issue”. How Is The Gospel Good News? Did you catch that? It was pretty subtle. He said “good news! Here is how you can be saved from my judgment!”. I do believe it is great news that I can be saved from judgment but it is actually not THE Good news it is not the gospel. In short Greg says that this announcement “…here is how you can be saved…” is the gospel. As a stand-alone word gospel simply means “good news”. It is not a word Christians created however. Before Jesus the Roman empire used the word gospel. It was the “good news” announcement that Caesar was the Lord via his kingdom the Roman Empire. This “good news” announcement was tied to the great “Pax Romana” or Roman Peace. Rome offered its people free bread, the protection of the Roman military and peace. All Rome wanted in return was absolute allegiance. There was even a cult dedicated to Caesar himself in which you could sacrifice animals to him as a god. So the word gospel during the time of Jesus already had a pretty solid meaning as something akin to a royal announcement of king Caesar and his glorious kingdom. This of course was how Roman folk would have heard it but what about Jewish folk? To Jewish people the “good news” was also about the rule and reign of a King in his Kingdom (see Isaiah 52:7). Israel saw good news as the proclamation of a coming king and kingdom. Jesus preaching was often referred to as “Good news (Gospel) of the kingdom” (See Matt 4: 23; 9: 35; 24: 14; Luke 4: 43; 8: 1; 16: 16; Acts 8: 12). Jesus was proclaiming the “good news” that the kingdom of God was at hand. In Jesus the rule and reign of God was breaking into the world through what theologian Michael Bird describes as “the dramatic intervention of Israel’s God in events like the Exodus or the future “day of the Lord”.” The gospel is the royal announcement or “good news” of who Jesus the Christ is, what he has done, is doing and will do. He then makes well-placed delineation of what the gospel “evokes”, what it “affects” without making those things the gospel in and of themselves. He makes it clear that the gospel is not all about me. The gospel is good news because of who and what it’s about, namely God and his inaugurated* kingdom. So what was Paul heralding, proclaiming, announcing or in other words “gospeling”? Jesus died, was buried, was raised, and appeared. Paul goes on to explain in 1 Corinthians 15:20-28 how this announcement has brought completion or consummation* to Israel’s story. The Gospel is good news about Jesus because the king who was proclaiming the kingdom didn’t die! He lives has ascended to his throne and reigns as Lord of Heaven and Earth. Jesus is The Son of Man and The Son of God in his reign. Whether a person believes this news, gets saved, gets converted or not it is still good news from heaven to earth. How Is The Gospel About Christ? “the resolution and fulfillment of Israel’s Story and promises”. The Gospel is good news about Christ because it ties the whole world into the promises made to Israel of a coming King and his kingdom. The proclamation is that Israel’s Lord is the Lord of heaven and earth this is good news. The title “Christ” isn’t meaningless to the Roman mind because it places Caesar under the reign of King Jesus as well. If the Gospel should not be confused with “personal salvation” or “getting saved” what is it? And what is it about? The Gospel best fits within the story of Scripture. There was a very good beginning, a very bad fall, judgment, a promise of a king and kingdom was made to the Israel. Israel, like a pregnant woman carrying with her this announcement delivered a king and with him a kingdom for the whole world waiting for consummation. The good news is that God’s “forever king” Jesus has come, he died but he rose again and lives as the lord of heaven and earth. If we can disciple people around this gospel announcement and stop trying to hook all our “pet” peripheral doctrines, standards and systems into this Gospel we will see the result will be more unity among believers. To give the Gospel is to announce that Jesus is King. It’s not about results, they will happen. To make disciples with this Gospel (announcement) is not about getting decisions, giving invitations, creating catchy plans of salvation followed with a sinner’s prayer. The goal of discipleship making is to teach believers and non-believers alike what resources have been made available to them (if they will by faith receive them) to love God and their neighbor in more and more significant ways through all that the Gospel “evokes” and “affects”. We should desire to make disciples because of the Gospel for the sake of the king and his coming kingdom. *Inaugurated: The formal beginning of His Kingdom Reign. *Consummation (Israel): the point at which his purpose with Israel is complete or finalized in regards to the unfolding revelation of the gospel. Some books I recommend for a deeper understanding of what this article is only touching on. Evangelical Theology: A Biblical and Systematic Introduction. Zondervan. Bird, Michael F. (2013). This is the absolute best theologically conservative Biblical/Systematic Theology I own. The King Jesus Gospel: The Original Good News Revisited. Zondervan. McKnight, Scot (2011). When this book came out it blew my mind. I have read it several times. It gave me a fresh perspective of the gospel. “Simply Good News” (below) hits the nail on the head but “The King Jesus Gospel” Hits the nail on the non-Anglican North American Evangelical head. This book is an excellent in addition to the King Jesus Gospel.